Skinny and Chubby are the best of friends, both born and raised in Belgium. They come from the Flemish city of Antwerp, better known as the city of fashion, the city of diamonds - or for them - the city of foodies! Antwerp proved to be a blessing in disguise for these two, hosting a variety of cultures from the surrounding areas. With only 30 minutes away from Brussels, an hour away from Amsterdam, and just a bit further to Paris or Aachen, the influx of neighboring cultures was absolutely inspiring. Most importantly, Skinny and Chubby grew up on some of the best foods from all across Europe. Time brought these troublemaking two to the United States, where Skinny married a New Yorker and Chubby snacked his way through college in Boston. Despite their distance from home, they often reminisced together about the delectable smells and flavors from their childhood. Since 2014, Skinny & Chubby have been shaking things up with their whimsical designs and unparalleled passion to share their love for authentic European treats. With premium packaging, premium quality, and premium products, they seek to share their favorite flavors with the world. 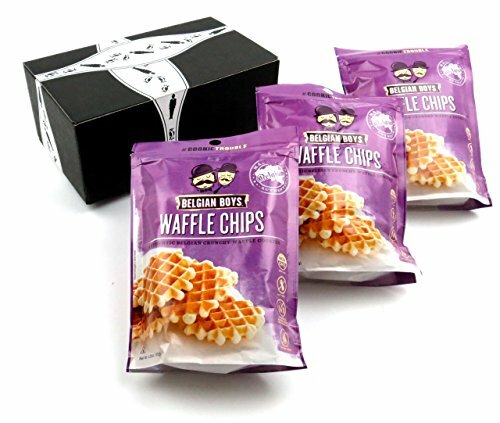 Now get a BlackTie Box for any occasion featuring one 4.23 oz package of Belgian Boys Waffle Chips and one 4.23 oz package of Belgian Boys Choco Waffle Chips.